It’s rare for me to have kids in the house for more than a few hours or even overnight. This is a temporary affair to warm up or dry off cold kids. Having one in the house longer leads to a major problem: Moving kids out to the barn. The little Nubian buck looks sweet. So deceptive. He is out and about during milking. He spends his time racing around. His favorite activity is leaping onto the plastic feed sack of trash with its satisfying explosion of crinkling sound. Does on the milk stands are adjusting and no longer trying to leap out of their skins. Those in for a short time go back out with their anxious mothers. Dry, fluffed and warmed up these kids do fine. Mother takes them back and raises them. Kids kept inside for several days are forgotten by their mothers, especially if there is a sibling out with the mother. That was what happened with this kid. Matilda assumed she had only one kid and rejected the little buck entirely. Nubian doe High Reaches Pixie’s Natasha knows she has two kids, but isn’t so sure what to do with them. She wants to stay with them. She wants back out with the herd. Luckily she is not disturbed by having the little buck move in with her. Mother goats do more than feed their kids. They protect their kids from the other goats. Goats have a pecking order with each lording it over those below her. Small kids, unprotected, are on the bottom and knocked around by everyone. Moving kids out to the barn therefore takes careful planning. If a kid is dumped out, it will be lost and attacked from all sides. All the kid knows is the house and people. Keeping the kid in the house is not tenable. It is not housebroken. Half a dozen towels are needed for each couple of days. At twelve hours old this little Nubian doe, one of Goat Town Gaius’ last kids, is still getting used to standing. By the next day she was up and walking around. By two days old, she was starting to hop. Older kids are ready to run, play and jump. Like small children, they explore and get into everything within reach. The kid was up in the recliner and on the bed. The cats fled or moved up as high as possible. I took the kid out to the barn during milking. This was fine. The kid explored the milk room and followed me around doing chores. And went back to the house. I took the kid out to meet his sister. Matilda was not impressed. She behaved only as long as I was right there. I do not wish to move into the barn. This little Nubian buck is one of Goat Town USA Gaius’ last kids. He will be the same deep red with added white markings. He is about twelve hours old here and in a dark barn – headache for picture taking. The kid had to move out to the barn. I was up against all the difficulties of moving kids out to the barn. He isn’t big enough or tough enough to make it on his own yet. He can’t be kept all alone. High Reaches Pixie’s Natasha delivered twins. She is a first time mother. She is not high in the pecking order. She is trying to decide how to be a good mother. The kid went to the barn and in the kidding section with Natasha and her kids. He isn’t happy. He is overjoyed when I show up and cries when I leave. But Natasha ignores him. Her kids will be big enough to play in a week. And the kid’s sister came into the milk room while Matilda was eating and getting milked. The two kids sized each other up. Moving kids out to the barn is tough. This little buck will make it. 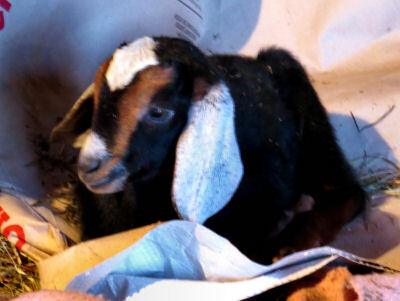 This entry was posted in High Reaches and tagged adjusting goat kids to the barn, keeping goat kids in the house, Newborn Nubian kids on March 27, 2019 by [email protected].